The enduringly popular ficus plants belong to the fig genus. Although only a few are seen in cultivation, there are hundreds of species of ficus. They are native throughout the tropics, including Asia, America, and Africa. These serve as decorative plants, food plants, and even religious symbols. Some types of ficus trees are also known as fig trees and produce the well-known fruit. The famous Bodhi tree under which Buddha achieved enlightenment was a Ficus religiosa. In their native habitats, ficus is often seen as a landscape tree with hanging and buttressed roots and a magnificent crown. In the home, ficus is a beautiful specimen plant that can provide many years of lush foliage. It is quite finicky, so be prepared for some specific care requirements. Mature Size: Outdoors up to 70 feet tall and 70 feet wide. Indoors 6 feet high and 3 feet wide. Bloom Time: Indoor plants are not likely to bloom. Outdoor plants bloom during spring. Many people experience frustration at the hands of ficus plants. They are prone to leaf drop in drafty, cold conditions, and they don't like to be moved. Ficus are also vulnerable to mites, mealybugs, whiteflies, and aphids. As tropical plants, they absolutely require adequate light, warmth, and humidity to look their best. While they do have specific growing requirements, few plants are quite as flexible as the ficus. F. benjamina is a favorite among bonsai growers and they can be braided or shaped. If your ficus is overgrowing its spot, don't be afraid to trim it back. New leaves will quickly sprout. Ficus tend toward legginess after a few years. A common problem with ficus plants is that it responds to stress by losing its leaves. Stress could be caused by any number of things including underwatering, overwatering, too little light, low humidity, change in temperature, draft, or pests. Ficus plants need bright light, but only acclimated plants can handle direct sun. They appreciate being moved outside in summer but do not place them in direct sunlight. Bright, direct light will scald the leaves and cause leaf loss. A ficus needs well-draining, fertile soil. Soil-based potting mixes should work well for this plant and provide the nutrients it needs. Avoid using soils for roses or azaleas, since these are more acidic potting soils. Water the ficus evenly throughout the summer and reduce watering in the winter. In dry homes, provide plenty of ambient moisture by misting often. Do not let the rootball dry out and check the soil before watering. These plants cannot tolerate low temperatures or drafts. Maintain a temperature above 60 degrees Fahrenheit at all times; they will do much better with temperatures above 70 degrees Fahrenheit. Any cold drafts from windows, doors, or air conditioning units will cause harm. Keep them away from a drafty location. They like a relatively humid environment. Regularly mist the leaves or provide a pebble tray filled with water below the plant. Feed your ficus with slow-release pellets at the beginning of the growing season. They are rapid growers and will benefit from monthly fertilization in the spring and summer and once every two months in the fall and winter. Ficus can be rooted from tip cuttings with rooting hormone. Use only non-woody stems as cuttings. For larger plants, air laying is the preferred method. F. benajmina. The F. benjamina has narrow glossy green leaves and grows into a small shrub or tree. This plant is less tolerant of cold and shade than the Rubber Tree. Variegated varieties include F. benjamina variegata and F. benjamina Starlight. F. elastica. The Rubber Tree has large, thick glossy leaves. Varieties include the F. elastica robusta with wide, large leaves and the F. elastica decora. F. lyrata. The Fiddle Leaf Fig has large, violin-shaped leaves up to 18 inches long. While not toxic, ficus plants are a concern to those who suffer from latex allergies. There is latex in the ficus plant and they should not be kept in the same environment as latex allergy sufferers. 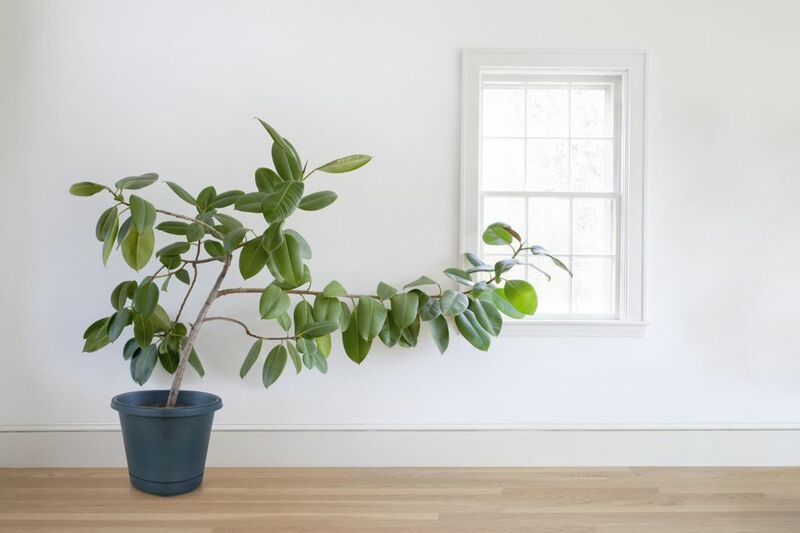 Prune your ficus tree to maintain its shape and prevent it from touching the ceiling. Pruning should take place in the winter when it's not actively growing. Wear gloves and use a sharp pair of pruning scissors. Cut back to just before a node so new growth will sprout there.